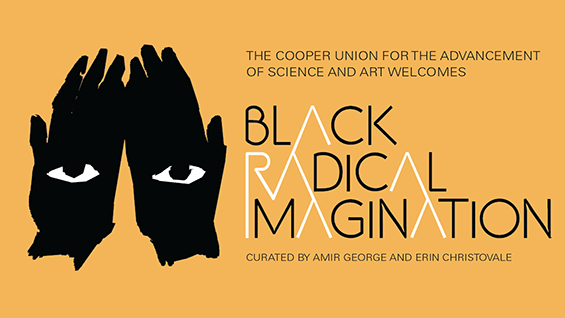 Black Radical Imagination is a touring program of visual shorts that delve into the worlds of new media, video art, and experimental narrative curated by Erin Christovale and Amir George. See the trailer. After a successful tour last year, including screenings in over 12 cities such as Los Angeles, Oakland, Boston, Basel Switzerland, and Chicago, as well garnering a feature in ARTFORUM’s Best of 2013, the series, along with a forum with filmmakers, comes to New York City at The Cooper Union for two days, starting this Friday April 11th through Saturday April 12th. Note: School of Art students interested in having a studio visit or one on one critique with an artist from Black Radical Imagination should email sebastiandegre@gmail.com to schedule an appointment. Films by Jeannette Elhers, Jabari Zuberi, Terence Nance & Sanford Biggers, Lauren Kelley, Lewis Vaughn and a special screening of Memory Room 452 by John Akomfrah and the Black Audio Film Collective. Followed by a panel. Martine Syms is a cultural entrepreneur based in Los Angeles and will be presenting her Mundane Futurist Manifesto and MOST DAYS - a new audio work that takes the form of table read for a science-fiction screenplay, with score by Neal Reinalda. The story considers what an average day looks like for a young, black woman in 2050 Los Angeles. Jeannette Elhers is a video and performance artist based in Copenhagen, Denmark whose works revolves around the Danish slave trade in the colonial era. Jeannette Ehlers will be performing “Whip It Good” - reenacting one of the most brutal punishment methods used during slavery. In using the same method on a white canvas, she creates a personal and simple, though contradictory, artistic act of striking back. Sponsored by Alanna Lockward/Artlabour Archives and Ballhaus Naunynstrasse.